All Corporate Residency MBA candidates are required to perfect their profile and résumé within the first three weeks of the program. This information is used to create a Portfolio of Candidates, which is made available to the Employer Partners at the end of July. 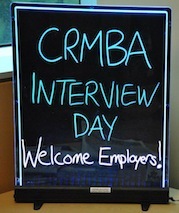 Interviews for corporate residencies take place throughout the fall term. Students offered a position with an Employer Partner are expected to accept, unless extenuating circumstances apply. We strongly advise thoroughly researching the organization and taking location, corporate culture, career goals, etc. into consideration before interviewing with an Employer Partner. Students also have the option of creating a self-developed corporate residency or an entrepreneurial residency and have access to the team in Management Career Services for assistance. If you had 60 seconds, could you persuade an employer to interview you? After your first summer in the Corporate Residency MBA program, you will know how to deliver an effective elevator pitch and ace the interview. —Read the full blog post by Kathleen Heymans on the Corporate Residency MBA blog.